Author Alan Lugton on Brother Walfrid, John Glass, and the early days of Celtic’s history. When the players of Hibs and Celtic run on to the Hampden pitch on Sunday for the Scottish Cup Final, they will only have one thing on their minds. For Celtic, winning the trophy will be the culmination of a successful season that has seen the Glasgow giants retain the league title and qualify for the last 16 of the Champions League, Europe’s elite football competition. For Hibs, lifting the Scottish Cup would bring an end to 111 years of pain for their supporters, all of whom have waited all of their lives to sing Sunshine on Leith in Easter Road while the players hold the trophy in the air. But Hibs and Celtic are more than just opponents in this year’s showpiece event. 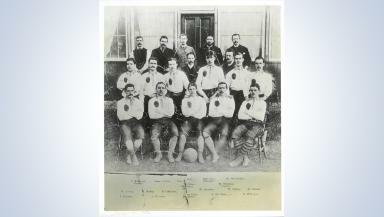 Their histories are linked all the way back to the days when Celtic were formed in 1888. “If there hadn’t been a Hibernian FC there certainly wouldn’t have been a Celtic FC,” comments Alan Lugton, a Hibs historian who has published three books on his team entitled The Making of Hibernian. Alan, who has watched the Easter Road men for over 60 years, looks back to a period when he believes Hibs went from being a major force in British football to a shadow of its former self due to the ambitions of Celtic, the new kid on the block. In the 1880s, with football an amateur pursuit of players, Hibs played a number of a charity matches across Scotland to raise money for those in need. Alan contends a key moment in the club’s history, and Celtic’s, occurred in September, 1885 when a second string Hibs side took on a team brought together under the banner Glasgow Hibs. The proceeds of the match went to poor children living in Glasgow’s East End. One of those who helped those children was Brother Walfrid. Many Celtic fans will recognise this figure and the founder of their club, the subject of a statue outside Parkhead, and - as newspapers have speculated - the man Oscar winner Daniel Day Lewis is interested in playing in a movie about the club. Alan, who used to work as an international air freight supervisor at Edinburgh Airport, believes this match was the event that Brother Walfrid decided that Glasgow, with its much larger Catholic population, should have its own team to raise money for those in need. Hibs went on to win the Scottish Cup in 1887, attracted a crowd of 12,000 to a charity match against Renton in Glasgow that year, and would go on to become ‘World Champions’ after defeating English FA Cup winners Preston North End. Alan said: “1887 was the climax for Brother Walfrid. 12,000 at a game was quite incredible. “Brother Walfrid was saying surely, in Glasgow, we can get a team together along the same lines as Hibs to do all this good work. Another man thought to be at that meeting was John Glass. The Irish businessman and others, Alan argues, had a very different outlook for Celtic. The author added: “While Brother Walfrid was looked upon as the founding father, a lot of the people in the background were Irish Glasgow businessmen, particularly John Glass. Hibs, quite happy to see another Irish team in Scotland, opened Celltic’s ground with a match against Cowlairs in 1888 but Glass was already looking forward. “Glass and his cohorts were eyeing up the Hibs players who had been on loan,” said Alan. “He wanted to poach these players. “In the summer, they made payments to six Hibs players who were amateurs. Willie Groves - probably the greatest football player Scotland has ever produced - James McLaren, Paddy Gallagher, Mick McKeown, John Coleman and Mick Dunbar. “They were six members of a fantastic Hibs team. There was a bitterly humorous thing said at the time - ‘When these men were with Hibernain football club, they played only for faith and Ireland. When they went to Celtic, they played for 30 shillings’. It would be eight years until Hibs would make another real mark in the Scottish game, finishing runner up in the 1896 Scottish Cup. Celtic, meanwhile, grew quickly and won its first Scottish Cup in 1892 and its first Scottish league championship the following year. The rest, as the saying goes, is history. “It had a disastrous effect on Hibs,” said Alan. “It left Hibs in a terribly weak position with the rise of Celtic and their immediate popularity. “They (Celtic) were able to get all the up and coming Irish lads in the west of Scotland. There was bitterness, but Hibs didn’t want to see a division in the Irish camp in Scotland. “Hibernian Football Club was the pride of the Irish in Scotland. They were they premier team. They won the Scottish Cup and put the Irish in Scotland on a public platform. Of course, very little of this history will matter to the 22 men who run out to the cheers of 52,000 supporters in Glasgow on Sunday. For Alan though, who will be in the crowd with his wife for the game, the history matters.